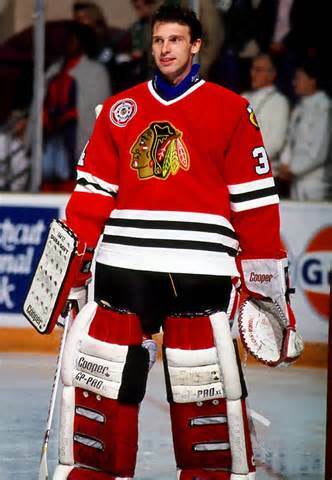 Before he was "The Dominator," Hasek was "The Awkwardnator"
The Pittsburgh Penguins and Chicago Blackhawks met for a nationally televised afternoon tilt on Sunday, with NBC opening the broadcast with a video homage of Chicago's 5-1 thrashing of Pittsburgh during their meeting at Soldier Field last season. The Penguins, of course, own the only playoff series win between the two clubs, with Mario Lemieux and company sweeping Ed Belfour, never-won-a-championship Jeremy Roenick, and Dominik Hasek (!) en route to Pittsburgh's second straight Stanley Cup championship in 1992. An injury-depleted Pens team managed to eke out an overtime point during their January 21st contest at the Consol Energy Center earlier this season. Missing from the Penguins lineup that day were Evgeni Malkin, Patric Hornqvist, and Blake Comeau. For Sunday's game, Pittsburgh scratched Zach Sill and the still-injured Christian Ehrhoff, with Steve Downie returning to the lineup after a one game absence. The opening five minutes of Sunday's game was a lot like "50 Shades of Grey": big promises of hitting and wild scoring that never quite happen, leading to an awful lot of bored people in the audience. During those opening moments, both teams traded one-and-done shot attempts, with Beau Bennett generating a dandy individual effort that led to a wrister that was turned aside by Chicago goalie Corey Crawford. Later, Blake Comeau chipped a puck past a Chicago defender and created a 2-on-1 with Patric Hornqvist, but a diving Duncan Keith negated any hope of a pass across the ice, so Crawford merely had to cut down the angle to deny Comeau of an early goal. NBC announcer Doc Emrick snuck in his obligatory Pittsburgh Pirates reference only 9 minutes into the game (Doc's Pirates' references make for a fine drinking game for those of you looking for an excuse to imbibe). Ben Smith of Chicago immediately followed with the least dangerous one-timer ever, flubbing badly and flicking a Tim Wakefield knuckler into the mitt of Marc-Andre Fleury. The two teams looked like contestants on "Duff to Dawn" the way both squads kept icing the puck. Hornqvist and Comeau once again generated a 2-on-1 following a great lead pass by Evgeni Malkin, but a Hornqvist deferral to Comeau was flicked away by the Chicago defender. On a subsequent possession, Hornqvist drove to the net like Billy Joel after Christie Brinkley left him and barely missed giving his team the 1-0 lead when his rising shot rang off of Crawford's mask and then the crossbar before going out of play. Letang and Spaling teamed up to handcuff Chicago's Patrick Kane Christian Grey style with three minutes left in the period. Letang would actually dump Kane awkwardly in the boards before starting the Penguins back up the ice in transition. Malkin would create his own scoring chance when Niklas Hjalmarsson was undressed by #71's move in the right circle, but Crawford, deep in his own net, made the save. The Penguins then generated a good scoring chance on the following faceoff, with Perron unable to bury the rebound and Letang's shot from the point went out of play. Chicago had a last-second scoring chance, but a diving Letang negated the Blackhawks' 2-on-1. Pittsburgh outshot the home team 21-9 while also leading in shots on goal, managing 15 to Chicago's 9. Rob Scuderi nearly gave his army of haters magazines of ammunition when his horrible cross-ice pass in front of his own net was picked off by Andrew Shaw, whose wrister was denied when Fleury flashed the leather. Niklas Hjalmarsson gave the Hawks the first tally of the game- and forced everyone to hear "Chelsea Dagger"- when he invoked the spirit of Tom Fitzgerald and scored on a slapshot from 3,172 feet away (rough estimate). David Perron almost tied it via a rebound on the doorstep, but Crawford made a tremendous kick save along the ice to keep the score 1-0. Pittsburgh got the game's first power-play chance when Steve Downie drew a penalty, but the Penguins could barely muster any offense. Seconds after Patrick Kane's penalty expired, Brandon Sutter got sent off for a lazy hook that would have made 2005 Sergei Gonchar proud. Marian Hossa, who famously chose-ah the wrong guys in 2009 by playing for the Red Wings, made a neat juggling play off of the right boards and swatted a shot that an alert Fleury had to blocker away. Simon Despres avoided a penalty when his backhanded clearing attempt was ruled to have gone out of play over the players bench and not the boards. The officials convened and decided not to penalize Despres two minutes for delay of game, thus giving the Penguins a break. Then, in what will probably become known "Crosbygate" (because people are wildly uncreative), Sidney Crosby was called for a clearly inadvertent trip, but following an officials' time out, the Penguins' captain was allowed out of the box with the call rescinded. The decision to wave off the Crosby penalty will be a hot button topic around the league as the retracted call is unprecedented in the minds of players, analysts and fans alike. Historically, officials have "fixed" dubious penalty calls by making a "make-up call," or, a penalty called for an incredibly minor infraction with the intention of evening up the number of players on the ice. Following Crosby-gate, Beau Bennett made yet another slick move in the offensive zone and his low shot on goal yielded a massive rebound that Nick Spaling wasted no time in depositing on the far side of the net, evening the score at 1-1. For Bennett, the assist resulted in a beam from the roof falling on him Wiley Coyote style was the culmination of arguably his best two periods of hockey this season. Meanwhile, Spaling's goal seemed to have unnerved the Blackhawks, as Brent Seabrook took an unnecessary cross-checking penalty to put the Penguins on the power-play for the second time. The opportunity went wasted when, once again, the Pens failed to convert with the man advantage, stretching their incompetence to a Lex Lutheresque 0-for-15. Marc-Andre Fleury had a frantic 20 or so seconds when his glove was knocked off, and he was forced to play barehanded until he could gather up his mitt. Sidney Crosby earned an actual penalty with 6 minutes left in the game when he tripped up his captain counterpart, Jonathan Toews, in the offensive end. Chicago maintained possession in the Penguins' zone throughout, but Fleury and the penalty killers held their own Sparta style (minus the painted abs) and kept the contest knotted at 1-1. The third period ended with a tie score, and as is usually the case when I write these recaps, the game went to overtime. With both teams only putting four players on the ice and with both rosters chock-full of skill, a Penguins/Blackhawks overtime seemed poised to offer exciting end-to-end action. Instead, there was only one shot through the first half of the overtime, and the Penguins proceeded to miss consecutive open net opportunities. Hossa, he of 7 goals in his last 4 games, nearly won it with a rising shot that Fleury had to shrug away with his shoulder. Chicago would muster one more scoring chance when Fleury gave up a juicy rebound off of a shot from the corner, but after the Penguins cleared, the Blackhawks were content to allow the clock to run out, sending the game to a shootout. David Perron skated in on Crawford and undid him with an in-out backhand that he roofed to the upper corner of the net. Not to be outdone, Toews spread Fleury's legs going left to right and slipped the puck home. Crosby then scored a humdinger when his shot flipped up and over the back of Crawford and went in. Patrick Kane then beat Fleury like a Buffalo cab driver to tie the shootout at 2-2. Kris Letang would then lose control of the puck on his shootout attempt, giving Crawford the easy save. Patrick Sharp then ended things, beating Fleury glove-side. Sharp's goal prompted Fleury to slash the post in frustration, as the Blackhawks earned the extra point.